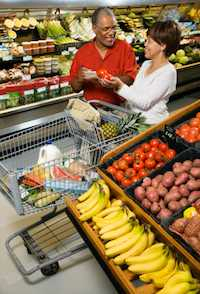 Smiling middle aged African American couple comparing produce in grocery store. While grocery shopping in Cabo San Lucas, you will find many of the familiar brands you can find in the United States as well as some local products. If you are staying in a Cabo Rental or Villa, visiting the grocery stores is a great way to stock up on food. Or if you are staying in a hotel, grabbing a few familar snacks is never a bad idea. Calle Morelos and Avenida Revolucion. Centro Comerical California (CCC) – This American-style supermarket has everything from great food to electronics. It has a great pastry section. The CCC is located right as you leave Cabo San Lucas on the east side of Mexico 19 and north of the junction with Mexico 1. It is owned by Ruffo’s, a family company from La Paz. City Club – This wharehouse style Cabo grocery store sells most products in bulk. Membership is required, but you can purchase a daily pass for about $5. It is located at Blvd Lazaro Cardenas and Paseo del Pescador. It is owned by Soriana. Diana’s Supermarco – With everything from meats to dairy products, fruits, vegetables and more, this Cabo Grocery store offers low prices and familar brands. Diana’s Supermarco is located at 20 de Noviembre at Ocampo. Soriana – This Walmart-style Cabo Superstore has just about everything. Soriana is located just on your way out of town towards Todos Santos at Carretera Todos Santos and Cruajitos Colonia Brisa del Pacifico. This local grocery store is the closest for those staying near the Marina. Supermarcado Aramburo is located at Lazaro Cardenas and Zaragoza at Aramburo Plaza. It is open daily from 7 am to 11pm. Matamoros and Vicrio at Lopex Mateos. In the Corridor you will find some of the stores you are familar with like Costco and Walmart. Most of the grcoery store baggers are not paid by the stores and work off of tips. 10-20 pesos (around a $1 – $2) is appropriate.